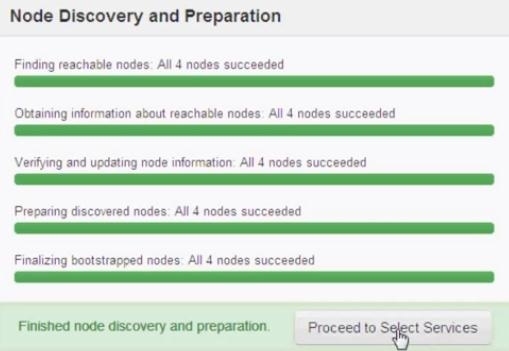 How To Install Hortonworks HDP 1.1 - How2Hadoop - Learn Hadoop Now! New: setup4hadoop.bash script file automates all of the preparation steps for installing Hadoop below! OS CentOS 5.8 CentOS is widely available and supported across many enterprises. 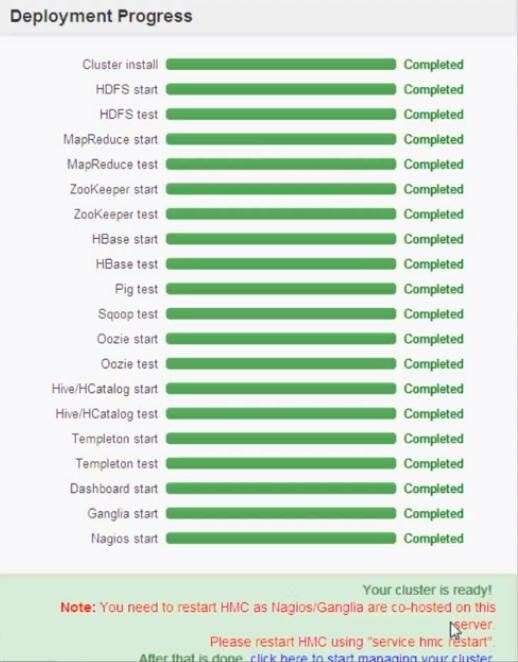 Hortonworks - HDP 1.0.1.14-1.el5 Hortonworks is an open-source distribution of Hadoop with open-source management tools staying aligned to and covering the Apache Hadoop software stack. Note: Small instances may be too 'small' for running jobs, but serves well to demonstrate an installation. Key Pairs - xyz123.pem Purpose is to quickly deploy a Hadoop cluster for Test & Development. Files Full list of installed files and version can be found here. Installation Files Attached with this installation documentation you will find all of the installation, configuration (/etc) and supporting log (/var/log) files downloaded from the nodes when the above installation took place (9-2012). This will allow you to troubleshoot or analyze the installation exactly utilizing the original files. ssh / sshd Password-less SSH must be enabled on all nodes. Don't forget to exit out of each session! yum / rpm Must be enabled and configured properly. DNS / Reverse DNS Must be enabled and configured properly. DNS server that is defined is a good idea. > Setup nodes n1,n2,n3 to be ready for password-less ssh. They will need the private key file to do this. Once we install pdsh we'll start executing commands against all 3 nodes. > Let's make sure we have the standard CentOS mirrorlist of repositories for yum to pull from. We are going to want to install pdsh so lets grab the HDP repo as well. # pdsh -a "chmod 700 /root/.ssh ; chmod 640 /root/.ssh/authorized_keys ; chmod 600 /root/.ssh/id_rsa"
> Find the set of commands we executed on h1 for editing the ssh configuration file and restarting services. Wrap pdsh -a and double quotes " around it. # pdsh -a "sed -i 's/^.*StrictHostKeyChecking. *$/StrictHostKeyChecking=no/' /etc/ssh/ssh_config ; service sshd restart"
> Connect from head node h1 to node1 from node1 to node2, and from node2 to node3. This is a quick check to makesure host aliases and password-less ssh is working on all nodes. > May want to even go from n3 back to another node in the cluster to test n3 just in case. # pdsh -a "rm /etc/yum.repos.d/*"
# pdsh -a "ls /etc/yum.repos.d/"
> Verify your handiwork, the command should not return a output from any of the nodes. 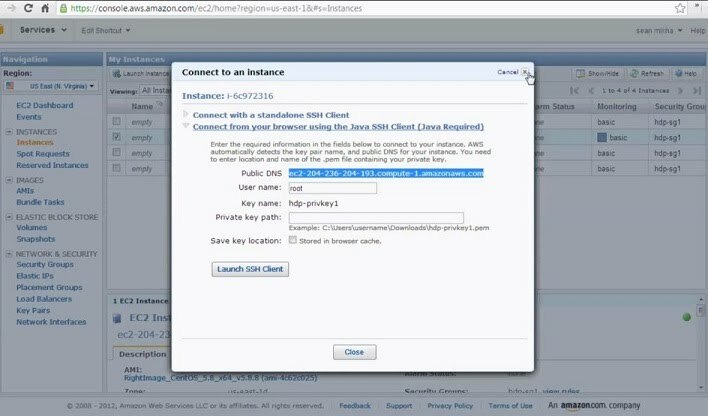 Include the private-dns address to each node in your EC2 instance. Make sure to have only 1 host per line, with no leading/trailing blank lines. Make sure to use this path and 'uncheck' the default path selected by the HDP Installation wizard. ntp / ntpd Must be enabled. The AMI we are using for CentOS 5.8 (and most distros for that matter) will not have the ntp service installed or configured. 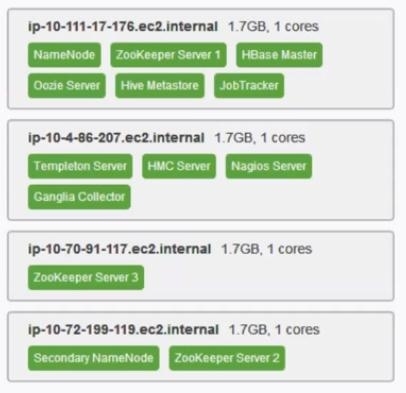 # pdsh -a "yum erase -y ruby* rrdtool*"
# pdsh -a "chkconfig ntpd on ; chkconfig iptables off ; chkconfig ip6tables off"
> We will install the HMC software on the head node to prepare the node cluster for the Hadoop installation. > Install the epel repository on the nodes. This gives access to dependant software necessary for the HMC installation. # pdsh -a "yum install -y php-pecl-json"
> Install php-pecl-json on the nodes. This gives access to the PECL repository as well as standard PHP and PHP extensions. # pdsh -a "mkdir /mnt/hdp1 /mnt/hdp1/1 ; chmod 777 /mnt/hdp1 /mnt/hdp1/1"
> Create the directory /mnt/hdp1/1 on all nodes and grant read/write/execute to all users to this directory so we hit no permissions issues during install. 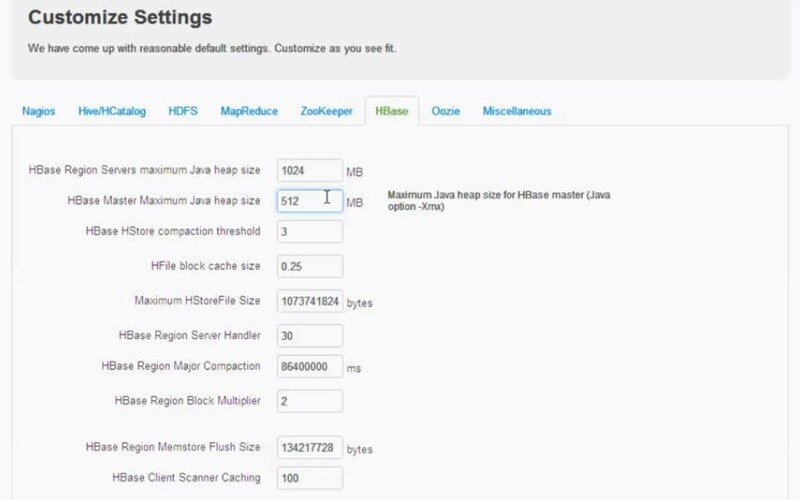 > This will start the HMC service and download any JAVA dependancies. Leave 'Use local yum mirror instead of download packages from the internet' unchecked.